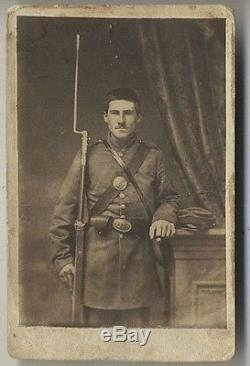 CDV photograph of Civil War soldier in Union uniform holding rifle with bayonet attached. There is no writing on the back. To see my other VINTAGE BOOKS AND PAPER currently listed. The item "C1860s Carte De Visite CIVIL WAR UNION SOLDIER With RIFLE CDV" is in sale since Friday, June 19, 2015. This item is in the category "Collectibles\Militaria\Civil War (1861-65)\Original Period Items\Photographs". The seller is "ahenzel" and is located in South Royalton, Vermont. This item can be shipped worldwide.